Rich Chicks truly whole muscle chicken tenderloins combine all the things you love about chicken and none of what you don’t. 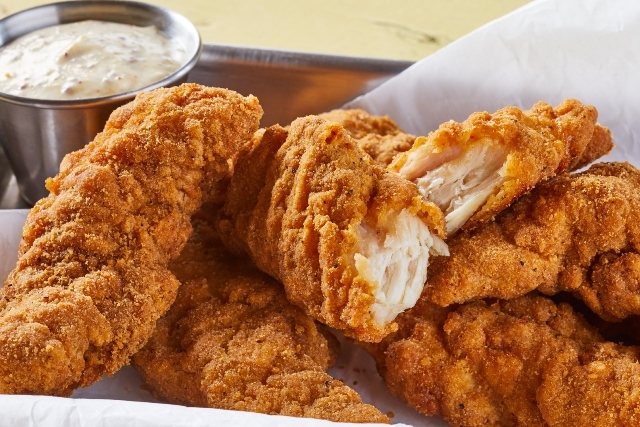 We don’t add fillers, binders, artificial colors or flavors to our whole muscle chicken tenderloins.What we do combine is truly whole muscle chicken tenderloins, with whole grain breading made from high quality ingredients you recognize and trust (and can pronounce).Rich Chicks, unrivaled quality, Rich in Flavor, Rich in Nutrition. Add some wonderful color to you next meal with fun spin on an old classic. Enjoy Rich Chicks Premium Whole Grain Breaded Whole Muscle Chicken Tenderloins on warmed flour tortillas, topped with a fresh chopped mango salsa combining fresh mango chunks, diced red onion, diced red bell pepper, purple cabbage, fresh chopped garlic and lime juice. Garnish with cilantro and enjoy! Build, enjoy, repeat. Rich Chicks, it’s what’s for lunch, or dinner, or whenever! Convection Oven: Bake at 375°F 8-10 minutes. Conventional Oven: Bake at 375°F 10-12 minutes. Chicken Breast with Rib Meat, Chicken Protein Solution (Water, Chicken Protein), Water, Whole Wheat Flour, Enriched Wheat Flour (Wheat Flour, Niacin, Reduced Iron, Thiamine Mononitrate, Riboflavin, Folic Acid), Oat Isolate, Salt, Leavening (Sodium Bicarbonate, Sodium Aluminum Phosphate), Spices, Garlic Powder, Hydrolyzed Wheat Gluten Protein, Soybean Oil (as a Processing Aid), Ascorbic Acid,Soy Flour, Extractives of Paprika, Natural Flavors. Breaded and Battered with: Whole Wheat Flour, Enriched Wheat Flour (Enriched with Niacin, Reduced Iron,Thiamine Mononitrate, Riboflavin, Folic Acid), Water, Salt, Leavening (Sodium Bicarbonate, Sodium Aluminum Phosphate), Soybean Oil (As a Processing Aid), Garlic Powder, Hydrolyzed Wheat Gluten Protein, Black Pepper, Yellow Corn Flour, Ascorbic Acid, Soy Flour, Extractives of Paprika, Egg Whites, Natural Flavors, Spice Extractive, Cellulose Gum. Breading Set in Vegetable Oil.